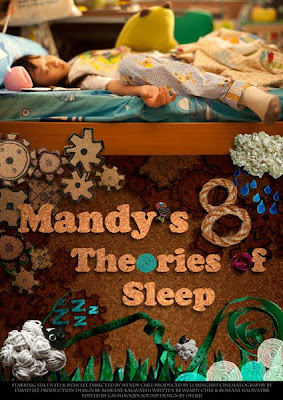 Wendy Chee's 'Mandy's 8 Theories of sleep' shows how simple child's play can turn into priceless moments. It is like a minor's version of Royston Tan's 15 (the short film) in which 2 characters go about conversing spontaneously and the result is effortlessly funny and subtly warm and fuzzy at the same time. It is not difficult to get a sense that Wendy has a way with getting the kids to lose all inhibitions and give us many moments of innocence and genius. Perhaps even lovable mischief. It is one production in which the director is very decided on what she wants and is confident about the delivery. In a way, she has chosen a very safe framework - get two kids, give them a structure to a conversation (actually just give them lines! ), get them comfortable by doing what they do best and voila! It can be too far from being endearing. 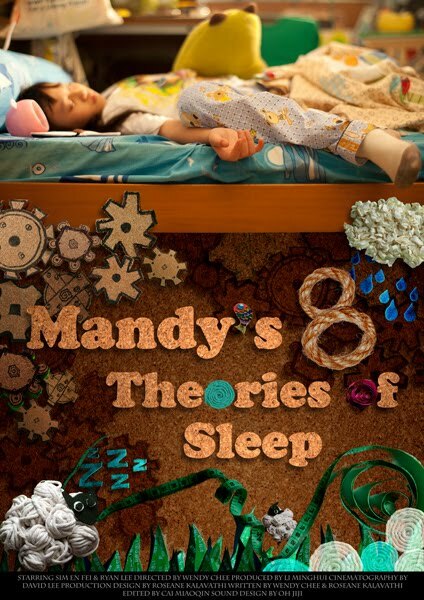 Mandy is a primary school girl who can't get enough of sleep. She can sleep anywhere, everywhere and anytime. Her parents try to break her habit but fail to. So enter Jia Ming, her opposite/nemesis/other half of the screen, who tries to break her attempts to sleep. In turn, she comes up with her 8 theories of sleep. The theories are child-like yet not without its share of wit and messages (like in the usual Disney features), so we adults have to pay attention to. Even when the theories are ridiculous, there is still some undeniable logic in them like 'Sleeping can make you grow taller,because you are not being pulled down by gravity'. Come on, you chuckled, didn't you? In a way, it is also a very kiasu film. The 2 kids were good enough to stir up some screen magic but Wendy took an extra step to embellish the scenes by creating countless visual surprises along the way. Kiddy props and set-ups were a signature in many of the scenes. There was probably a fair amount of colour grading to give it that candy-coloured world look. If that's not enough, the cleverest trick was the use of a familiar idea - kids in adult positions. Though this is not entirely original, Wendy's got her personal touch to directing her kids in way that looked like they were in their element even though rehearsed. Guess it take a kid to direct another and Wendy's certainly let her kid out. A scene to remember is Jia Ming clasping Mandy's hair using the cover of his pencil box and but in the end gets hit by the pencil box when she executes a knee-jerk reaction upon waking up. Classic. Kid's films are a plenty because of one reason - they light up the screen easily. It is almost exploitative. Not that it is terribly easy to work with kids as well. To get the little devils to work magic for you sometimes needs a meeting of the sun, stars and the moon. But if you genuinely love kids and are a kid yourself, it gets easier and it shows.